Shoreham boss Sammy Donnelly is hoping to boost his frontline ahead of Saturday's trip to third-placed Chichester City. Picture by Stephen Goodger. A new striker at Middle Road is Shoreham boss Sammy Donnelly’s number one priority as his side took a break from league action last Saturday. Due to AFC Uckfield Town’s FA Vase game at home to Sutton Common Rovers, which was subsequently postponed due to the poor weekend weather, Donnelly and his players had a rest week and this has given the Musselmen manager time to assess his squad. Goals have been in short supply for Shoreham, with only one goal scored in their past three league games, and Donnelly recognises that a boost in their striking options is necessary. 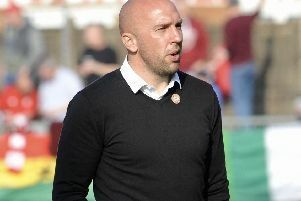 He revealed that he is in talks with a player but was wary that the player could change their mind about coming to Middle Road. He said: “I’m talking to players at the moment but your best laid plans can fall apart really. Players say one thing but it could go another way but we’re optimistic we can make at least one signing. With the Musselmen enjoying a week’s rest, Donnelly revealed the break had its positives and negatives. After falling to a 4-1 away defeat against Peacehaven & Telscombe in their last league fixture Donnelly was itching to get back out onto the pitch but was pleased his team couldn’t accrue any more injuries. He added: “I think we’d have all rather played but if you look at the conditions we had at the weekend unless you had Astroturf it could have been a bit of a lottery. “You miss your Saturdays when you’re not playing but on the other hand it’s given a couple of players time to heal a little bit. We’ve had a couple of injuries here and there so I think a break would have done them a bit of good. Up next for the Musselmen is a trip to third-placed Chichester City on Saturday. City have taken 37 points from 16 games and were one of only two SCFL Premier Division games to take place at the weekend as they snatched a late winner to beat Langney Wanderers 3-2. Ahead of this game, Donnelly described high-flying Chi as ‘the best side in the league’ but revealed that one of his players would miss the rest of the season through injury. He said: “From what I’m lead to believe, Chichester are the best side in the league. They’re quite strong at home so it’ll be a tough match. “We’ve got to go up there and be prepared to roll our sleeves up and give a good account of ourselves. You never know what’s going to happen in football but it will be a tough game on Saturday. “I’ve lost Neil Watts for the season. His knee has been playing up so he will have to retire for the rest of the season.